For a few years now, Turner Classic Movies has traditionally aired The Uninvited (1944) during Halloween season. A gothic mystery/romance with a lighter heart than Rebecca (1940), The Uninvited is another of my cold night favorites. Though lacking any gun or knife, let alone even a drop of blood or a hint of gore, The Uninvited can subtly spook the unsuspecting viewer. The action begins jauntily enough as a pair of vacationing Londoners, brother and sister, hike the cliffs of Devon and Cornwall and find, fall in love with and purchase a long-empty mansion overlooking the sea. The two later come to the realization that their new home is haunted and that their new friend, the former owner's lovely granddaughter, is a target of the malevolent apparition who inhabits the house. This is a phantom whose arrival, sometimes partially materialized, brings with it a penetrating chill that terrorizes all who encounter it...including the family pets. And there is the sudden overpowering scent of mimosa that signals an unseen presence as it fills a room. Heightening these spine-tickling proceedings is a rapturous score by Victor Young with a haunting motif that later became the popular standard, "Stella by Starlight." The film was directed by Lewis Allen and photographed by cinematographer Charles Lang (Midnight, A Foreign Affair, The Magnificent Seven, Charade) who was Oscar-nominated for The Uninvited. This year in tandem with watching The Uninvited, I read the book on which it was based. Irish author Dorothy Macardle's novel was first published in 1942, four years after du Maurier's smashing success, Rebecca, appeared in print and two years after the enormously popular Hitchcock/Selznick 'picturization' was released. It, too, is of the modern gothic genre with roots reaching back to Bronte's Jane Eyre. Macardle's book is engaging, lively and, though not equal to du Maurier's classic in any sense, it entertainingly transports today's reader to a time, place and world view now several decades gone. Macardle could weave a tale and hold one's attention, telling her spooky story of warring spirits from the first person perspective of the protagonist, Roderick Fitzgerald, a London journalist whose move to the seaside brings with it hair-raising adventure, a new turn in his writing career and new love. The adaptation from novel to screen is largely faithful. The book is peopled by a greater variety of characters and the back story of each principal is more detailed. On screen, the haunted mansion's name changed from 'Cliff's End' to 'Windward House,' Roderick Fitzgerald is referred to as 'Rick' rather than 'Rod' and Miss Holloway's role is expanded. Fitzgerald's profession was changed from writer to composer - perhaps in order to ease giving Victor Young's "Stella by Starlight" its center-stage moment in the film. 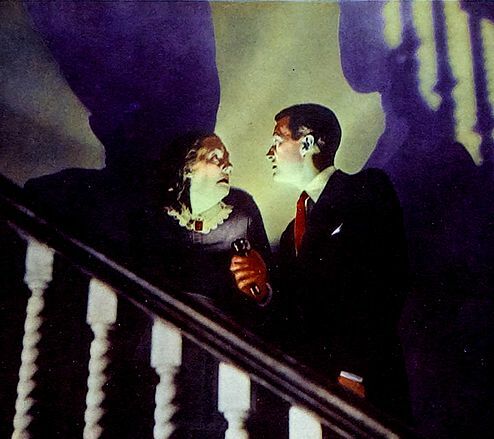 Young's theme for The Uninvited enhances the film's romantic and mysterious story. By comparison, Franz Waxman's score for Rebecca, though also dramatic and powerful, seems to me, at times, overwhelming. I knew Bernard Herrmann had, when he was with CBS Radio, scored an earlier radio presentation of Rebecca and I found this intriguing given his later association with Hitchcock. In the end, the music Herrmann scored for Rebecca eventually made its way to the screen; much of it was used in Jane Eyre (1943) starring Orson Welles and Joan Fontaine. 19-year-old Gail Russell, in her screen debut as Stella Meredith, is another high point in The Uninvited. Fresh-faced, with dark, tousled hair and long, thick lashes, Russell projects a fetching mixture of fragility and intensity as a young girl faced with a deadly threat just as she experiences first love. Russell followed The Uninvited with a role in Our Hearts Were Young and Gay - coincidentally, she portrayed Cornelia Otis Skinner in the film (she played Skinner again in Our Hearts Were Growing Up). In 1945 Russell was cast in a quasi-sequel to The Uninvited called The Unseen (with Joel McCrea), and she made a number of films co-starring with John Wayne, who befriended her when they made Angel and the Badman in 1947. But Russell's life and career were blighted by serious personal demons. A beautiful teenager who'd been embarrassed by the nickname "The Hedy Lamarr of Santa Monica High," she had long suffered from crippling shyness. When Paramount Pictures came calling she agreed to pursue a movie career; her mother had insisted, the family needed money. Russell developed a habit early on of drinking before she faced the cameras - it helped steady her nerves. This habit developed into a deadly addiction that shortened her life; she died in 1961 at age 36. 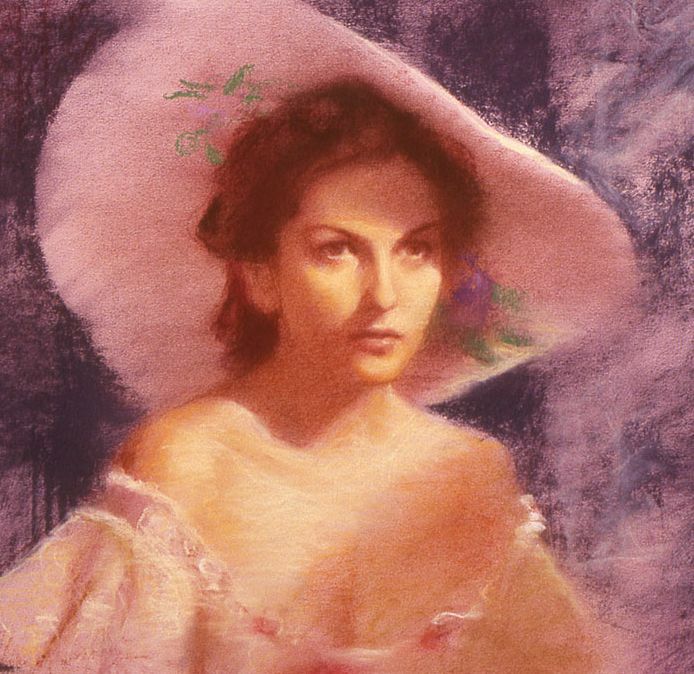 The characters of Stella Meredith in The Uninvited and Rebecca's second Mrs. de Winter are fairly similar - both are young, inexperienced and in need of protection and guidance. But one character evolves more than the other. Throughout The Uninvited, Stella remains a maiden in need of rescue by older, wiser Roderick Fitzgerald. In Rebecca, the second Mrs. de Winter begins as an awkward, coltish young lady utterly intimidated by all that her new status as bride of an aristocrat brings. But when Maxim de Winter confesses his role in Rebecca's death and reveals his vulnerability, her transformation into a more confident, assured woman begins. Fontaine's portrayal of this maturing is seamless. Eve, an interesting comparison of the two books and two films. 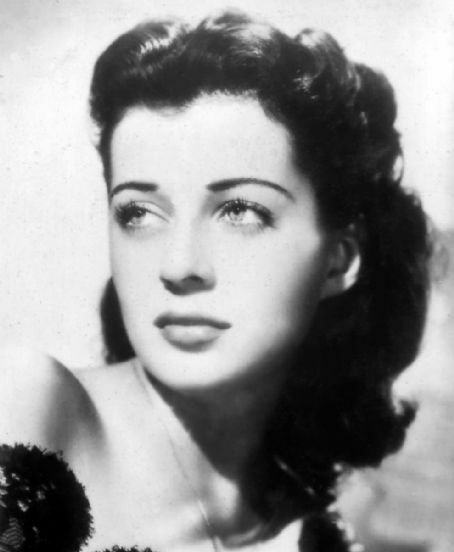 Gail Russell's life was a sad one. She came across in "The Uninivited" as shy and fragile, and incredibly beautiful with that dark hair and those big, gorgeous, pale blue eyes--one of those faces and presences the camera just loves. I haven't seen "Our Hearts Were Young and Gay" in many years but recall the movie as quite enjoyable, with Russell and Diana Lynn a marvelous pair of adventurous young women. I did see Russell in the Western "Seven Men from Now" awhile back and she was still very effective but did look sadly worn beyond her years. When I watched "The Uninvited" a couple of weeks ago, it seems that Ruth Hussey did call Ray Milland "Rick" at least once, which had me wondering if I'd misheard his name at the beginning, but I suppose Rick could also be a family nickname for Roderick. The only thing I didn't like in the movie was Cornelia Otis Skinner, whose performance seemed hammy in comparison with those of the other actors. I thought Donald Crisp was quite strong as Stella's overprotective grandfather, and it was interesting to see Alan Napier (who I'll always think of as Alfred the butler in TV's "Batman") in a rare romantic role as the village doctor. I still remember how good the great Charles Lang made "The Uninvited" look from my first viewing of it many years ago on TV. R.D. 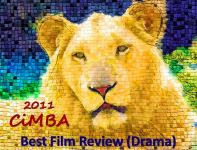 - I almost felt it was unfair to compare the two - "Rebecca," book and movie, is so strong - in a league of its own. But "The Uninvited" is deservedly considered a classic in its own right. When I first watched it years ago on TV, it gave me shivers. The supernatural mood is so well done and the twist at the end so unexpected. I'm much more aware of the film's lighter moments now than I was the first time around. Cornelia Otis Skinner does lay it it on a bit thick as Miss Holloway - for years I thought Gale Sondergaard had played the role. Dorothy Macardele seems to have had an interesting life, certainly not one of those who sat around the house churning butter and making bread. I thought Gail Russell managed to convey a combination of innocence and a delicateness that could fall off the edge with just one wrong turn. Wonderfully atmospheric and spooky. It can definitely send chills down your spine. As a film, I still prefer REBECCA but this is not far behind. Thank you for reviewing "The Uninvited," Lady Eve. I rashly boycotted all the "Halloween" themed movies last month and thus missed this classic. Bernard Herrmann is such an outstanding composer that I understand why his music score would be superior. And on the other film you bring up, Jane Eyre, Orson Welles plays my favorite Rochester. But I'll now have to be on the lookout for "The Uninvited." John - At first I thought there might be two Dorothy Macardle's - a novelist and an activist/historian. Seems she was politically active all her life. There is a biography out called "Dorothy Macardle: A Life" but I haven't read it. Christian - As I was writing this I began to think I was involved in '6-degrees-of...' something. Bronte's "Jane Eyre" is the gothic template for du Maurier's "Rebecca"...Orson Welles produced and performed in "Rebecca" on radio, Welles co-starred with Joan Fontaine in the film version of "Jane Eyre" and Fontaine had been the star of the film "Rebecca"... Hitchcock directed "Rebecca" and later Bernard Herrmann, who scored "Rebecca" on radio (the score later being used in "Jane Eyre," the film), scored several of Hitchcock's films. This is an inspired and extremely well written series! I look forward to another installment! 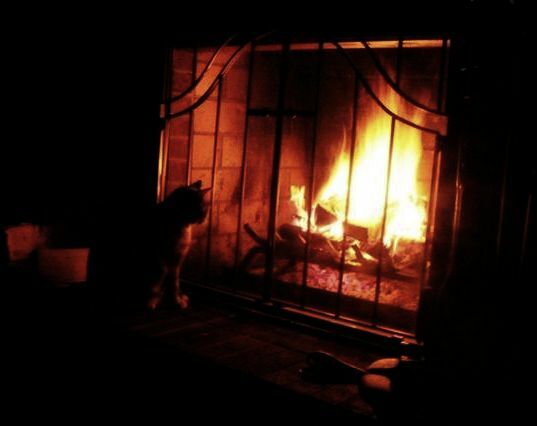 Ladyeve, We are expecting a huge storm to hit AZ over the weekend your Ultra-Rich Hot Chocolate, sounds delicious. Your post is perfect timing for me, I'm now in the mood to grab the book "The Uninvited", blanket, a cosy chair and a mug of hot chocolate and spend a nice cosy day inside. Fascinating background on Macardle. Thanks. What a joy it is to curl up with a hot drink and feel a cold chill down your back. No matter how picturesque, I'm staying away from stately manners and hilltop estates. I love the colours of autumn, and your series is making me appreciate the early, darkened evenings. Gilby - Thanks...not sure if there'll be another installment, but I'm glad you enjoyed I and II. Dawn - I don't envy you the coming storm, but it does give the opportunity to curl up in a chair (with a mug of warmth) and read. I think you'll enjoy "The Uninvited." CW - I didn't learn of Macardle's background til after I read "The Uninvited." Was surprised - I imagine activist/historian types as very serious, not spinners of ghostly gothic yarns. A woman of many facets, she was. Eve, a fascinating look at the author, the novel and those who brought “The Univited” to the screen. I knew nothing about Dorothy MacCardle (such a fascinating life) and I was unaware Gail Russell had sadly died so young. I found a copy of “The Uninvited” through the library; unfortunately “Rebecca” is checked-out through mid-December. I wonder how you feel about reading “My Cousin Rachel” followed by the film version with Olivia de Havilland and Richard Burton? I guess I’m looking for an excuse to try one or both of your drink recipes: the hot chocolate sounds yummy but I’ve never tried a tea-based drink, simply sublime. Gypsy - Glad you were able to get a copy of "The Uninvited" and will be interested in your reaction. I enjoyed reading and watching "Rebecca" so much this year that I'm thinking of making it an autumn tradition. And - I like your idea about "My Cousin Rachel." Lady Eve - you are a full-service blogger! Not only do you provide refreshment and background music, but you never fail to entertain and inform! I so agree that there is an eerie similarity about those 2 ladies. As for the scores, it's hard to beat the dreaminess of Stella by Starlight, but I do agree that the Waxman Rebecca score is a bit much (but then again, isn't Manderley? Really, a nice little mansion would have been sufficient). I think you've hit on something about Waxman's score - it's very Manderley (and both are very David O.Selznick: larger-than-life, extravagant). I've always had a fondness for the early Ray Milland films and this one has always been at the top alongside MINISTRY OF FEAR, another good film for a chilly Fall or Winter's night. I read that Lawrence Olivier wanted Vivien Leigh for the role of the second Mrs. DeWinter and when he couldn't get his way, he made life miserable for Joan Fontaine on the set. Didn't stop Fontaine's wonderful performance though. I see I've already mentioned the Olivier/Fontaine story in my comments on the the previous post . Sorry about the repetition. Chalk it up to 'old lady memory' striking yet again. I especially love this whole idea of watching films uninterupted by commercials (as in Hulu). Since I'm always the last to find out things, I've just discovered this film watching thing recently. I have to admit, I love it. Oh, Vivien Leigh would have been perfect for the dead Rebecca. Absolutely. I'm late for Part 2! I have to say I haven't seen The Uninvited but I believe it was you that reminded me so thoughtfully that it would be airing on TCM. I did tape it but sadly it's still sitting on my DVR. I wish I had watched it before wasting my time on Annie Get Your Gun! (darn musicals) but I had a good reason since I'm doing research for a post on Betty Hutton. Now to your wonderful review. I think I will comment again after I've seen the film if that's okay. I feel like I'm missing out. I haven't seen Stella by Starlight either. Joan Fontaine is my favorite classic actress as I mentioned during your last post. Glad she got more time here. Oh, I always loved The Uninvited, and I'm so glad you wrote a blog on it and did the film justice. This film deserves to be on DVD along with some etra features to boot! Gail was a delightful actress and she was very adept at comedy too ( Our Hearts Were Young and Gay )It's such a contrast to see Cornelia Otis Skinner in a diabolical role when her writings are so light hearted and amusing. Thank you for this well-researched blog...it was as entertaining to read, as The Uninvited is to watch. Birdie - So glad you dropped by...& I hope visitors here will check out your blog (The Absent-Minded Buccaneer) and your post on "The Dawn Patrol." I haven't seen "Our Hearts Were Young and Gay" (or its sequel), but will. I don't think I've seen Gail Russell in anything but "The Uninvited." She is so perfectly suited to the part of Stella that it's almost as if I haven't wanted to know her as anyone else.